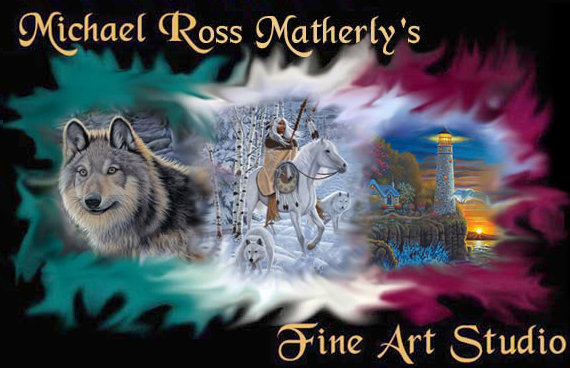 Michael Ross Matherly has achieved many outstanding credits to his career. The Franklin Mint commissioned him to create a series of twelve collector plates titled "The Majestic Cats" Collection, which are sold around the world and was presented by the National Wildlife Federation. According to The Franklin Mint, Michael is one of three artists to ever create a twelve plate series in the history of their company. The International Wildlife Coalition endorsed another collector plate Michael created for The Franklin Mint. That plate was titled "Midnight Majesty." The United States Postal Service has issued several postage stamps designed by Michael. His work has been issued on six Indiana Game-bird Habitat Stamp and Indiana Trout-Salmon Stamps, chosen from competitions. Other designs include several National Wildlife Federation Conservation Stamps. Some of his commissions consist of several different works for the Postal Commemorative Society, and Anheuser Bush. Inter-Governmental Philatelic Corp. commissioned him for twenty-five different designs. Also to his credits, include covers and illustrations for numerous national and state magazines. Michael's artwork is licensed by many different manufacturers and produced on dozens of different products sold worldwide such as print reproductions, greeting cards, mugs, coasters, trivets, T-shirts, jigsaw puzzles, tapestry afghan throws, woven pillows, calendars, mirrors, mirror coat racks, furniture, cross stitch, tote bags, decorative tins, wallpaper wall murals, kiln fired tile wall murals, woven men's and women's cardigans and pullovers, magnets, decals, serving trays, see-through auto window graphics, paint-by-number kits, gun safes and many new licenses are in the works. Michael's originals and fine art reproductions have been sought after by collectors world wide. Click here to view the Franklin Mint "Majestic Cats" plate series, postal stamps and others. You can also go to the Gift Shop and view other products with Michael's artwork.